Emissions trading (also known as cap and trade) is a market-based approach to controlling pollution by providing economic incentives for achieving reductions in the emissions of pollutants. Various countries, states and groups of companies have adopted such trading systems, notably for mitigating climate change. In contrast to command-and-control environmental regulations such as best available technology (BAT) standards and government subsidies, cap and trade (CAT) programs are a type of flexible environmental regulation that allows organizations to decide how best to meet policy targets. There are active trading programs in several air pollutants. For greenhouse gases, which cause climate change, permit units are often called carbon credits. The largest greenhouse gases (GHG) trading program is the European Union Emission Trading Scheme, which trades primarily in European Union Allowances (EUAs); the Californian scheme trades in California Carbon Allowances, the New Zealand scheme in New Zealand Units and the Australian scheme in Australian Units. The United States has a national market to reduce acid rain and several regional markets in nitrogen oxides. Recent reduction in California's GHG emissions are not attributed to carbon trading but to other factors such as renewable portfolio standards and energy efficiency policies; the 'cap' in California has been and continues to be larger than actual emission rates. GHG emissions increased at more than half of industrial point sources regulated by California's cap and trade program from 2013 to 2015. In theory, polluters who can reduce emissions most cheaply will do so, achieving the emission reduction at the lowest cost to society. Cap and trade is meant to provide the private sector with the flexibility required to reduce emissions while stimulating technological innovation and economic growth. In practice the theory can fall short. Environmental hotspots arise and impact areas nearest pollution sources when credits are purchased in lieu of emission reductions; low-income neighborhoods and people of color tend to be located near large industrial point sources and suffer adverse health and welfare effects disproportionately. In addition to environmental justice issues, historically cap and trade policy is not as effective as performance standards for reducing air pollutant emissions. For example, sulfur dioxide (SO2) emissions and acidic sulfate deposition decreased to a larger extent more rapidly in Europe than in the United States over similar time periods with Europe employing traditional control approaches compared to the U.S.' subsidized market approach. Pollution is a prime example of a market externality. An externality is an effect of some activity on an entity (such as a person) that is not party to a market transaction related to that activity. Emissions trading is a market-based approach to address pollution. The overall goal of an emissions trading plan is to minimize the cost of meeting a set emissions target. The resulting inflexible limitations on GHG growth could entail very large costs, perhaps running into many trillions of dollars globally countries, if have to solely rely on their own domestic measures is one important economic reality recognised by many of the countries that signed the Kyoto Protocol. As a result, international mechanisms which would allow developed countries flexibility to meet their targets were included in the Kyoto Protocol. The purpose of these mechanisms is to allow the parties to find the most economical ways to achieve their targets. These international mechanisms are outlined under Kyoto Protocol. in this case is a triangular matrix of ones.
. Therefore, a polluter that affects water quality at a number of points has to hold a portfolio of licenses covering all relevant monitoring-points. In the above example, if country 2 wants to emit a unit of pollutant, it should purchase two permits: one for location 2 and one for location 3. More than three-quarters of respondents, 77.0%, reported they “strongly support” (51.0%) or “somewhat support” (26.0%) the EPA's decision to regulate carbon emissions. While 68.6% of respondents reported being “very willing” (23.0%) or “somewhat willing” (45.6%), another 26.8% reported being “somewhat unwilling” (8.8%) or “not at all willing” (18.0%) to pay higher prices for “Green” energy sources to support funding for programs that reduce the effect of global warming. Cap and trade is the textbook exaple of an emissions trading program. Other market-based approaches include baseline-and-credit, and pollution tax. They all put a price on pollution (for example, see carbon price), and so provide an economic incentive to reduce pollution beginning with the lowest-cost opportunities. By contrast, in a command-and-control approach, a central authority designates pollution levels each facility is allowed to emit. Cap and trade essentially functions as a tax where the tax rate is variable based on the relative cost of abatement per unit, and the tax base is variable based on the amount of abatement needed. President Barack Obama in his proposed 2010 United States federal budget wanted to support clean energy development with a 10-year investment of US$15 billion per year, generated from the sale of greenhouse gas (GHG) emissions credits. Under the proposed cap-and-trade program, all GHG emissions credits would have been auctioned off, generating an estimated $78.7 billion in additional revenue in FY 2012, steadily increasing to $83 billion by FY 2019. The proposal was never made law. In 2006, the California Legislature passed the California Global Warming Solutions Act, AB-32, which was signed into law by Governor Arnold Schwarzenegger. Thus far, flexible mechanisms in the form of project based offsets have been suggested for three main project types. The project types include: manure management, forestry, and destruction of ozone-depleted substances. However, a ruling from Judge Ernest H. Goldsmith of San Francisco's Superior Court stated that the rules governing California's cap-and-trade system were adopted without a proper analysis of alternative methods to reduce greenhouse gas emissions. The tentative ruling, issued on 24 January 2011, argued that the California Air Resources Board violated state environmental law by failing to consider such alternatives. If the decision is made final, the state would not be allowed to implement its proposed cap-and-trade system until the California Air Resources Board fully complies with the California Environmental Quality Act. [needs update] California's cap-and-trade program ranks only second to the ETS (European Trading System) carbon market in the world. In 2012, under the auction, the reserve price, which is the price per ton of CO2 permit is $10. Some of the emitters obtain allowances for free, which is for the electric utilities, industrial facilities and natural gas distributors, whereas some of the others have to go to the auction. In an effort to reverse the adverse consequences of air pollution, in 2006, China started to consider a national pollution permit trading system in order to use market-based mechanisms to incentivize companies to cut pollution. This has been based on a previous pilot project called the Industrial SO2 emission trading pilot scheme, which was launched in 2002. Four provinces, three municipalities and one business entity was involved in this pilot project (also known as the 4+3+1 project). They are Shandong, Shanxi, Jiangsu, Henan, Shanghai, Tianjin, Liuzhou and China Huaneng Group, a state-owned company in the power industry. This pilot project did not turn into a bigger scale inter-provincial trading system, but it stimulated numerous local trading platforms. In 2014, when the Chinese government started considering a national level pollution permit trading system again, there were more than 20 local pollution permit trading platforms. The Yangtze River Delta region as a whole has also run test trading, but the scale was limited. In the same year, the Chinese government proposed establishing a carbon market, focused on CO2 reduction later in the decade, and it is a separate system from the pollution permit trading. China currently emits about 30% of global emission, and it became the largest emitter in the world. When the market launched, it will be the largest carbon market in the world. The initial design of the system targets a scope of 3.5 billion tons of carbon dioxide emissions that come from 1700 installations. It has made a voluntary pledge under the UNFCCC to lower CO2 per unit of GDP by 40 to 45% in 2020 when comparing to the 2005 levels. The effort to start a national trading system has faced some problems that took longer than expected to solve, mainly in the complicated process of initial data collection to determine the base level of pollution emission. According to the initial design, there will be eight sectors that are first included in the trading system, chemicals, petrochemicals, iron and steel, non-ferrous metals, building materials, paper, power and aviation, but many of the companies involved lacked consistent data. Therefore, by the end of 2017, the allocation of emission quotas have started but it has been limited to only the power sector and will gradually expand, although the operation of the market is yet to begin. In this system, Companies that are involved will be asked to meet target level of reduction and the level will contract gradually. Trading is set to begin in 2014 after a three-year rollout period. It is a mandatory energy efficiency trading scheme covering eight sectors responsible for 54 per cent of India's industrial energy consumption. India has pledged a 20 to 25 per cent reduction in emissions intensity from 2005 levels by 2020. Under the scheme, annual efficiency targets will be allocated to firms. Tradable energy-saving permits will be issued depending on the amount of energy saved during a target year. In terms of dollars, the World Bank has estimated that the size of the carbon market was US$11 billion in 2005, $30 billion in 2006, and $64 billion in 2007. The Marrakesh Accords of the Kyoto protocol defined the international trading mechanisms and registries needed to support trading between countries (sources can buy or sell allowances on the open market. Because the total number of allowances is limited by the cap, emission reductions are assured.). Allowance trading now occurs between European countries and Asian countries. However, while the US as a nation did not ratify the protocol, many of its states are developing cap-and-trade systems and considering ways to link them together, nationally and internationally, to find the lowest costs and improve liquidity of the market. However, these states also wish to preserve their individual integrity and unique features. For example, in contrast to other Kyoto-compliant systems, some states propose other types of greenhouse gas sources, different measurement methods, setting a maximum on the price of allowances, or restricting access to CDM projects. Creating instruments that are not fungible (exchangeable) could introduce instability and make pricing difficult. Various proposals for linking these systems across markets are being investigated, and this is being coordinated by the International Carbon Action Partnership (ICAP). ^ a b c d e "Cap and Trade: Key Terms Glossary" (PDF). Climate Change 101. Center for Climate and Energy Solutions. January 2011. Archived from the original (PDF) on 2017-10-05. Retrieved 27 October 2014. ^ "Allowance Trading". U.S Environment Protection Agency. Retrieved Oct 21, 2014. ^ Judson Jaffe; Matthew Ranson; Robert N. Stavins (2009). "Linking Tradable Permit Systems: A Key Element of Emerging International Climate Policy Architecture" (PDF). Ecology Law Quarterly. 36 (789). Retrieved 2010-08-25. ^ Tietenberg, Tom (2003). "The Tradable-Permits Approach to Protecting the Commons: Lessons for Climate Change". Oxford Review of Economic Policy. 19 (3): 400–419. doi:10.1093/oxrep/19.3.400. Retrieved 2010-08-25. ^ Stavins, Robert N. (November 2001). "Experience with Market-Based Environmental Policy Instruments" (PDF). Discussion Paper 01-58. Washington, D.C.: Resources for the Future. Retrieved 2010-08-25. ^ a b "Emissions trading schemes around the world", Parliament of Australia, 2013. ^ "Tax Treaty Issues Related to Emissions Permits/Credits" (PDF). OECD. Retrieved 25 Oct 2014. ^ a b c Teeter, Preston; Sandberg, Jorgen (2016). "Constraining or Enabling Green Capability Development? How Policy Uncertainty Affects Organizational Responses to Flexible Environmental Regulations". British Journal of Management. 28 (4): 649–665. doi:10.1111/1467-8551.12188. ^ EU Emissions Trading System (EU ETS) Archived December 14, 2009, at the Wayback Machine. UK Department of Energy and Climate Change. Retrieved 2009-01-19. ^ "USEPA's Clean Air Markets web site". US EPA. Retrieved 2009-11-03. ^ "California's climate emissions are falling, but cap-and-trade is not the cause | Near Zero". Retrieved 2019-01-04. ^ S, Robert; ers; July 10, Media relations|; 2018July 13; 2018 (2018-07-10). "California's cap-and-trade air quality benefits go mostly out of state". Berkeley News. Retrieved 2019-01-04. ^ a b c d Montgomery, W.D (December 1972). "Markets in Licenses and Efficient Pollution Control Programs". Journal of Economic Theory. 5 (3): 395–418. doi:10.1016/0022-0531(72)90049-X. ^ "Cap and Trade: Acid Rain Program Results" (PDF). Environmental Protection Agency. 2014-08-12. Archived from the original (PDF) on 24 September 2015. ^ Chestnut, Lauraine G.; Mills, David M. (November 2005). "A fresh look at the benefits and costs of the US acid rain program". Journal of Environmental Management. 77 (3): 252–266. CiteSeerX 10.1.1.364.2934. doi:10.1016/j.jenvman.2005.05.014. ISSN 0301-4797. PMID 16171931. ^ a b Cap and Trade 101, Center for American Progress, January 16, 2008. ^ a b c d e Boswall, J. and Lee, R. (2002). Economics, ethics and the environment. London: Cavendish. pp.62–66. ^ "Cap and Trade 101". United States Environmental Protection Agency. Retrieved 27 October 2014. ^ "How cap and trade works". Environmental Defense Fund. Retrieved 27 October 2014. ^ "International Cooperation: Agreements and Instruments" (PDF). Archived from the original (PDF) on 2014-09-29. Retrieved 2014-11-10. ^ Burton, Ellison, and William Sanjour (1967) An Economic Analysis of the Control of Sulphur Oxides Air Pollution DHEW Program Analysis Report No. 1967-69 Washington, D.C.: Ernst and Ernst. ^ Burton, Ellison, and William Sanjour. (1968). A Cost-Effectiveness Study of Particulate and SOx Emission Control in the New York Metropolitan Area. NTIS: PB-227 121/1. Contract Number: PH-86-68-37. Washington, D.C.: Ernst and Ernst. ^ Burton, Ellison, and William Sanjour. (1969). A Cost-Effectiveness Study of Air Pollution Abatement in the Greater Kansas City Area. NTIS: PB-227 116/1. Washington, D.C.: Ernst and Ernst. ^ Burton, Ellison, and William Sanjour. (1969). A Cost-effectiveness Study of Air Pollution Abatement in the National Capital Area. NAPCA Contract No. PH 86-68-37, NTIS: PB227110. Washington, D.C.: Ernst and Ernst. ^ Burton, Ellison, and William Sanjour. (1970). 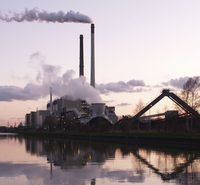 Applications of Cost-Effectiveness Analysis to Air Pollution Control. DHEW Contract No. CPA 22-69-17. Washington, D.C.: Ernst and Ernst. ^ Burton, E. S.; Sanjour, William (1970). "A Simulation Approach to Air Pollution Abatement Program Planning". Socio-Economic Planning Science. 4: 147–150. doi:10.1016/0038-0121(70)90036-4. ^ Burton, Ellison S., Edward H. Pechan III, and William Sanjour. (1973). A Survey of Air Pollution Control Models. Rolf A. Deininger, ed. Ann Arbor: Ann Arbor Science Publishers. ^ Burton, Ellison S.; Edward, H. Pechan III; Sanjour, William (1973). "Solving the Air Pollution Control Puzzle". Environmental Science and Technology. 7 (5): 412. doi:10.1021/es60077a011. PMID 22283532. ^ U.S. Environmental Protection Agency. (1972). The Economics of Clean Air, Annual Report of the Environmental Protection Agency to the Congress of the United States. Washington, D.C.: U.S. Government Printing Office. ^ Voss, Jan-Peter (2007). "Innovation processes in governance: the development of emissions trading as a new policy instrument". Science and Public Policy. 34 (5): 329–343. doi:10.3152/030234207x228584. ^ Coase, Ronald H. (1960). "The Problem of Social Cost". Journal of Law and Economics. 3 (1): 1–44. doi:10.1086/466560. ^ Crocker, T. D. (1966). The Structuring of Atmospheric Pollution Control Systems. The Economics of Air Pollution. H. Wolozin. New York, W. W. Norton & Co.: 61–86. ^ Dales, John H (1968). "Land, Water, and Ownership". The Canadian Journal of Economics. 1 (4): 791–804. doi:10.2307/133706. JSTOR 133706. ^ Gillenwater, Michael; Seres, Stephen (March 2011). "The Clean Development Mechanism: A Review of the First International Offset Program" (PDF). Pew Center on Global Climate Change. p. 6. Retrieved 26 November 2016. ^ Grimeaud, D, ‘An overview of the policy and legal aspects of the international climate change regime’ (2001) 9(2) Environmental Liability 39. ^ Stewart, R, "Economic incentives for environmental protection: opportunities and obstacles", in Revesz, R; Sands, P; Stewart, R (eds. ), Environment Law, the Economy and Sustainable Development, 2000, Cambridge University Press. ^ a b Roos, Joseph A.; Barber, Valerie; Brackley, Allen M. (March 2011). "Cap and Trade: Offsets and Implications for Alaska" (PDF). Retrieved 27 October 2014. ^ "China's national carbon market to start in 2016 -official". Reuters UK. Retrieved 25 September 2015. ^ Diesendorf, Mark (July 14, 2014). Sustainable Energy Solutions for Climate Change. Routledge. ^ "Key points: Update Paper 6: Carbon pricing and reducing Australia's emissions". Garnaut Climate Change Review. 17 March 2011. Retrieved 16 July 2013. ^ a b Stavins, Robert N (1998). "What Can We Learn from the Grand Policy Experiment? Lessons from SO2 Allowance Trading". The Journal of Economic Perspectives. 3. American Economic Association. 12 (3): 69–88. doi:10.1257/jep.12.3.69. JSTOR 2647033. ^ Cox, Stan (2013). "Any way you slice it: The past, present and future of rationing". New Press Books. ^ Hall, JV and Walton, AL, "A case study in pollution markets: dismal science US. Dismal reality" (1996) XIV Contemporary Economic Policy 67. ^ "Tax Treaty Issues Related to Emissions Permits/Credits" (PDF). OECD. Retrieved 22 November 2014. ^ Lavelle, Marianne (November 3, 2010). "A U.S. Cap-And-Trade Experiment to End". National Geographic. Retrieved November 7, 2010. ^ "Carbon Place . EU - Market with carbon credits - EUA, CER, ERU, VER, AAU-S, AAU-G". Retrieved 25 September 2015. ^ "Majority of Poll Respondents Say U.S. Should Limit Greenhouse Gases", Washington Post. 25 June 2009. ^ a b Roberts, David (26 Jun 2009). "What can we learn from polls on cap-and-trade?". Grist. Retrieved 27 October 2014. ^ Chomitz, Kenneth M. (1999). "Evaluating Carbon Offsets from Forestry and Energy Projects: How Do They Compare?". Policy Research Working Paper Series. 2357. World Bank. SSRN 630729. ^ a b c Rosen, Harvey S.; Gayer, Ted (2008). Public Finance. New York: McGraw-Hill Irwin. pp. 90–94. ISBN 978-0-07-351128-3. ^ a b Burney, Nelson E. (2010). Carbon Tax and Cap-and-trade Tools : Market-based Approaches for Controlling Greenhouse Gases. New York: Nova Science Publishers, Inc. ISBN 9781608761371. ^ Durning, Alan (July 2009). "carBon tax vS. cap and trade" (PDF). Cap and Trade 101 a Federal Climate Policy Primer: 28. Archived from the original (PDF) on 7 July 2014. Retrieved 27 October 2014. ^ Calel, Raphael, "The Language of Climate Change Policy", 2010. ^ Map: Pollution hotspots, BBC map of areas that suffer from intense local pollution, BBC News, 2004-12-13. Retrieved 2009-10-19. ^ "Chicago Climate Exchange prices". 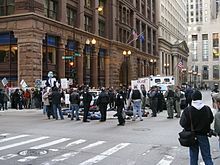 Chicagoclimatex.com. 2009-08-04. Archived from the original on 2009-11-05. Retrieved 2009-11-03. ^ Weitzman, M. L. (October 1974). "Prices vs. Quantities". Review of Economic Studies. 41 (4): 477–491. doi:10.2307/2296698. JSTOR 2296698. ^ Philibert, Cédric (October 2006). "Certainty versus ambition economic efficiency in mitigating climate change" (PDF). International Energy Agency Working Paper Series. Paris: International Energy Agency/OECD. LTO/2006/03. Retrieved 2010-01-24. ^ Jacoby, D.H.; Ellerman, A.D. (March 2004). "The safety valve and climate policy". Energy Policy. 32 (4): 481–49. doi:10.1016/S0301-4215(03)00150-2. hdl:1721.1/3561. ^ a b c "World Development Report 2010: Development and Climate Change" (PDF). World Bank. 2010. Retrieved 2010-04-06. ^ a b Barker, T.; et al. (2007). "Mitigation from a cross-sectoral perspective". In B. Metz; et al. (eds.). Climate Change 2007: Mitigation. Contribution of Working Group III to the Fourth Assessment Report of the Intergovernmental Panel on Climate Change. IPCC. Retrieved 2010-04-05. ^ Goldemberg, J.; et al. (1996). "Introduction: scope of the assessment" (PDF). In J.P. Bruce; et al. (eds.). Climate Change 1995: Economic and Social Dimensions of Climate Change. Contribution of Working Group III to the Second Assessment Report of the Intergovernmental Panel on Climate Change. IPCC. p. 31. doi:10.2277/0521568544. ISBN 978-0-521-56854-8. ^ Houser, Trevor; Rob Bradley; Britt Childs Staley; Jake Werksman; Robert Heilmayr (2008). Leveling The Carbon Playing Field: International Competition and U.S. Climate Policy Design. Peterson Institute for International Economics. ^ "Kyoto Protocol". UNFCCC. Retrieved 2009-09-16. ^ "Climate Change 2007: Mitigation of Climate Change, Summary for Policymakers from IPCC Fourth Assessment Report" (PDF). Working Group III, IPCC. 2007-05-04. pp. Item 25, page 33. Archived from the original (PDF) on 2007-05-18. Retrieved 2007-05-10. ^ Robert W., Hahn (November 2011). "The effect of Allowance Allocations on Cap-and-Trade System Performance" (PDF). Journal of Law and Economics. 54 (4). Retrieved November 22, 2014. ^ B. Metz; et al., eds. (2007). "Glossary". Climate Change 2007: Mitigation. Contribution of Working Group III to the Fourth Assessment Report of the Intergovernmental Panel on Climate Change. IPCC. Archived from the original on 2010-05-03. Retrieved 2010-04-23. ^ "LULUCF under the Kyoto Protocol". UNFCCC. Retrieved 2010-04-28. ^ "UNFCCC Countries 1990 to 2012 emissions targets". UNFCCC. 2008-05-14. Retrieved 2009-11-03. ^ "Emissions Trading". UNFCCC. Retrieved 2009-09-16. ^ Yamin, F, Burniaux, J-M ad Nentjes, A, "Kyoto Mechanisms: key issues for policymakers for CoP-6; international environmental agreements" (2001) 1 Politics, Law and Economics 187–218. ^ Haites, E and Yamin, F, "The clean development mechanism:proposals for its operation and governance" (2000) 10 Global Environmental Change 27–45. ^ "Global Carbon Mechanisms: Emerging lessons and implications (CTC748)". Carbon Trust. March 2009. Retrieved 2010-03-31. ^ "The Greenhouse Gas Reduction Scheme". NSW: Greenhouse Gas Reduction Scheme Administrator. 2010-01-04. Retrieved 2010-01-16. ^ Passey, Rob; MacGill, Iain; Outhred, Hugh (2007). "The NSW Greenhouse Gas Reduction Scheme: An analysis of the NGAC Registry for the 2003, 2004 and 2005 Compliance Periods" (PDF). CEEM discussion paper DP_070822. Sydney: The UNSW Centre for Energy and Environmental Markets (CEEM). Retrieved 2009-11-03. ^ "Abbott defends carbon tax interview". ABC News. Retrieved 25 September 2015. ^ "Julia Gillard's carbon price promise", The Australian, 20 August 2010. ^ Leslie, Tim (2011-02-24). "Gillard unveils Carbon Price Details". ABC News. ^ Hudson, Phillip (2011-02-26). "Tony Abbott calls for election on carbon tax". Herald Sun. Retrieved 2011-05-05. ^ Johnston, Matt (October 12, 2011). "Carbon tax bills pass lower house of federal Parliament". Herald Sun. Retrieved October 12, 2011. ^ AAP with Reuters (2011-11-08). "Carbon tax gets green light in Senate". Sydney Morning Herald. ^ "Opposition vows to repeal carbon tax". Sydney Morning Herald. 2011-10-02. ^ "Abbott Government's first actions: trash climate change education, carbon pricing", Indymedia Australia, 20 September 2013. Accessed 8 November 2013. ^ "Carbon tax scrapped: PM Tony Abbott sees key election promise fulfilled after Senate votes for repeal". ABC News. Retrieved 25 September 2015. ^ "Climate Change Response (Emissions Trading) Amendment Act 2008 No 85". www.legislation.govt.nz. Parliamentary Counsel Office. 25 September 2008. Retrieved 25 January 2010. ^ Hon Nick Smith (25 November 2009). "Balanced new law important step on climate change". New Zealand Government Press Release. Retrieved 14 June 2010. ^ "ETS Amendment Bill passes third reading" (Press release). New Zealand Government. 9 November 2012. Retrieved 12 November 2012. ^ "New Zealand's Greenhouse Gas Inventory 1990–2010 and Net Position Snapshot". Ministry for the Environment. October 2012. Retrieved 10 November 2012. ^ a b c "Summary of the proposed changes to the NZ ETS". Emissions trading bulletin No 11. Ministry for the Environment. September 2009. Retrieved 15 May 2010. ^ "New Zealand's Greenhouse Gas Inventory 1990–2008". ME 1009. Ministry for the Environment. April 2010. ISSN 1179-223X. Retrieved 22 May 2010. ^ a b "How will the changes impact on forestry?". Questions and answers about amendments to the New Zealand Emissions Trading Scheme (ETS). Ministry for the Environment. 14 January 2010. Retrieved 16 May 2010. ^ "Waste - New Zealand Climate change information". Ministry for the Environment. 15 July 2011. Retrieved 26 July 2011. ^ "Emissions Trading Worldwide ICAP Status Report 2015" (PDF). ICAP. 10 February 2015. Retrieved 16 March 2015. ^ "New Zealand Units (NZUs)". Climate change information New Zealand. Ministry for the Environment, NZ Government (www.climatechange.govt.nz). 18 June 2010. Retrieved 13 August 2010. 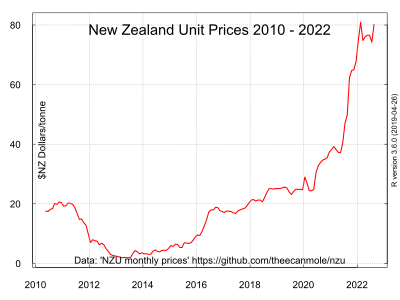 In the short term, the Government is unlikely to sell emission units because the Kyoto units allocated to New Zealand will be needed to support New Zealand's international obligations, as well as allocation to eligible sectors under the emissions trading scheme. ^ "Who will get a free allocation of emission units?". Questions and answers about the emissions trading scheme. Ministry for the Environment, NZ Government. 14 January 2010. Retrieved 15 May 2010. ^ "Agriculture". Summary of the proposed changes to the NZ ETS - Emissions Trading Bulletin 11. Ministry for the Environment. September 2009. Retrieved 16 May 2010. ^ "Industrial allocation update". Emissions trading bulletin No 12, INFO 441. Ministry for the Environment, NZ. September 2009. Retrieved 8 August 2010. The Bill changes the allocation provisions of the existing CCRA from allocating a fixed pool of emissions to an uncapped approach to allocation. There is no longer an explicit limit on the number of New Zealand units (NZUs) that can be allocated to the industrial sector. ^ "How will free allocation of emission units to the industrial sector work now?". Questions and answers about amendments to the New Zealand Emissions Trading Scheme (ETS). Ministry for the Environment. 14 January 2010. Retrieved 16 May 2010. ^ "Issues statement for public consultation". NZ ETS Review 2011. Ministry for the Environment. 21 April 2011. Retrieved 4 November 2011. ^ a b c Jones, B.; et al. (October 2007). "Appendix 1.2 Climate Change: Economic Impact and Policy Responses". World Economic and Financial Surveys, World Economic Outlook, Globalization and Inequality. IMF: 64. Retrieved 2010-04-26. ^ "Britain, California to join forces on global warming". The Washington Times. 2006-07-31. Retrieved 2009-11-03. ^ Wagner, M. Firms, the Framework Convention on Climate Change & the EU Emissions Trading System. Lüneburg: Centre for Sustainability Management 2004, p. 12. 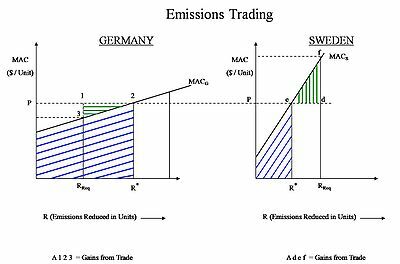 ^ a b "The EU Emissions Trading System (EU ETS)"
^ a b c d "Chapter 4: Carbon markets and carbon price". Building a low-carbon economy – The UK's contribution to tackling climate change. Committee on Climate Change. December 2008. pp. 140–149. Retrieved 2010-04-26. ^ Grubb, M.; et al. (3 August 2009). "Climate Policy and Industrial Competitiveness: Ten Insights from Europe on the EU Emissions Trading System" (PDF). Climate Strategies. p. 11. Retrieved 2017-04-25. ^ Kanen, J.L.M. "Carbon Trading & Prcing". Fulton Publishing (December 2006), pp. 68–69. ^ "EU action against climate change" (PDF). European Commission. 2007. p. 24. Retrieved 2017-04-25. ^ Norwegian Ministry of the Environment (2007). "The Norwegian Government accepts to include the EU Emissions Trading Directive in the EEA agreement". European Commission. p. 24. Retrieved 2010-08-03. ^ "Economic Survey of Norway 2010: Sustainable development: climate change and fisheries policies". Organization for Economic Co-operation and Development. 2010. Retrieved 2017-04-25. ^ "EU greenhouse gas emissions and targets". European Commission. Retrieved 23 October 2014. ^ "Tokyo Metropolitan Government Leads Japan, Launches Own GHG Emissions Cap-and-Trade Program". Artcraft Japan. 16 July 2010. Retrieved 5 August 2010. ^ a b China's Carbon Emission Trading, 2012. ^ "Tokyo CO2 credit trading plan may become a model". Reuters. 11 February 2010. Retrieved 25 April 2017. ^ a b Business Green (2010-04-08). "Tokyo kicks off carbon trading scheme". The Guardian. Retrieved 2010-12-29. ^ "Urban Environment and Climate Change - Publications". Retrieved 25 September 2015. ^ "Emissions Trading Worldwide ICAP Status Report 2015" (PDF). ^ "Acid Rain Program 2007 Progress Report". Clean Air Markets - Air & Radiation. US EPA. January 2009. Retrieved 2011-07-25. ^ Carlson, Curtis; Burtraw, Dallas; Cropper, Maureen; Palmer, Karen L. (2000). "Sulfur dioxide control by electric utilities: What are the gains from trade?". Journal of Political Economy. 108 (6): 1292–1326. doi:10.1086/317681. ^ "Cross-State Air Pollution Rule (CSAPR)". United States Environment Protection Agency. 2011-07-09. Archived from the original on 2011-07-11. Retrieved 2011-07-10. ^ a b "Cap and Trade". United States Environmental Protection Agency. Retrieved 27 October 2014. ^ "Ozone Fact Sheet", Environmental Protection Agency. Retrieved 25 April 2017. ^ a b Deschênes, Olivier; Greenstone, Michael; Shapiro, Joseph (2017). "Defensive Investments and the Demand for Air Quality: Evidence from the NOx Budget Program". American Economic Review. 107 (10): 2958–2989. doi:10.1257/aer.20131002. ISSN 0002-8282. 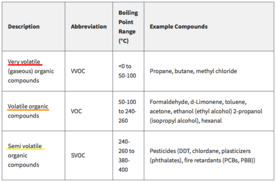 ^ "Volatile Organic Compounds (VOCs) in Commonly Used Products". www.health.ny.gov. Retrieved 2017-11-30. ^ a b Synthesis, NAWQA VOC National. "Chapter 1 - Major Findings and Conclusions". water.usgs.gov. Retrieved 2017-11-30. ^ a b "Volatile Organic Compounds (VOCs) in Your Home - EH: Minnesota Department of Health". www.health.state.mn.us. Retrieved 2017-11-30. ^ "President's Budget Draws Clean Energy Funds from Climate Measure". Renewable Energy World. Retrieved 2009-04-03. ^ "The American Clean Energy and Security Act (H.R. 2454)". Energycommerce.house.gov. 2009-06-01. Retrieved 2010-06-14. ^ Dryzek, John S.; Norgaard, Richard B.; Schlosberg, David (2011). The Oxford Handbook of Climate Change and Society. Oxford University Press. p. 154. ISBN 9780199683420. ^ Mayer, Jane (30 August 2010). "Covert Operations: The billionaire brothers who are waging a war against Obama". The New Yorker. Retrieved 20 March 2015. ^ Lizza, Ryan (11 October 2010). "As the World Burns: How the Senate and the White House missed their best chance to deal with climate change". The New Yorker. ^ Turin, Dustin R. (2012). "The Challenges of Climate Change Policy: Explaining the Failure of Cap and Trade in the United States With a Multiple-Streams Framework". Student Pulse. 4 (6). ^ Brüning, Kristian; Cohen, Jeff (2008-03-07). "Beyond the Kyoto six". Carbon Finance. Fulton Publishing. Archived from the original on 2011-07-27. Retrieved 2011-07-26. ^ Barringer, Felicity (4 February 2011). "California Law to Curb Greenhouse Gases Faces a Legal Hurdle". The New York Times. Retrieved 9 February 2011. ^ Buchanan, Wyatt (4 February 2011). "Calif. cap-trade plan dealt blow by S.F. judge". San Francisco Chronicle. Archived from the original on 8 February 2011. Retrieved 9 February 2011. ^ California Cap and Trade, Center for Climate and Energy Solutions, January 2014. ^ Summary of California's Cap and Trade Program, Center for Climate and Energy Solutions. ^ a b "Highly Reactive Volatile Organic Compound Emissions Cap and Trade Program". TCEQ. Retrieved 2017-11-30. ^ "California, New Mexico and 3 Canadian provinces outline regional cap-and-trade program", Los Angeles Times, 28 July 2010. ^ "Six US states leave the Western Climate Initiative" (18 November 2011). S&P Global Platts. Retrieved 2016-11-26. ^ "6 States Pull Out of Western Climate Initiative" (22 November 2011). SustainableBusiness.com News. Retrieved 2016-11-26. ^ "Emissions Reduction Market System What Is ERMS?". Illinois EPA. 2007. ^ Bartson, Andrew (March 29, 2006). "China Considers Tradable Pollution-Rights Permits". The Wall Street Journal. ^ a b "Can China's Industrial SO2 Emissions Trading Pilot Scheme Reduce Pollution Abatement Costs?" (PDF). Sustainability. 2014. ^ a b "China considers national pollution permit trading". Under2 Coalition. 2014-01-14. Retrieved 2018-09-08. ^ a b c "China Looks Towards Next Steps For Implementing National Carbon Market". ICTSD. January 18, 2018. ^ "China could launch national carbon market in 2016". CLIMATE HOME. ^ Andrews-Speed, Philip (November 2014). "China's Energy Policymaking Processes and Their Consequences". The National Bureau of Asian Research Energy Security Report. Retrieved December 24, 2014. ^ a b "Factbox: Carbon trading schemes around the world". Reuters. Retrieved 25 September 2015. ^ Feng, Emily (December 19, 2017). "China moves towards launch of carbon trading scheme". Financial Times. ^ "China to Launch World's Largest Emissions Trading System". UNFCCC. December 19, 2017. ^ "Global carbon market to rise 15% in value in 2014". Climate Home. Retrieved 25 September 2015. ^ a b "State and Trends of the Carbon Market" (PDF). World Bank. 2006. Retrieved 2017-04-25. ^ "State and Trends of the Carbon Market" (PDF). World Bank. 2005. Retrieved 2017-04-25. ^ "Global carbon markets have shrunk in value by 60% since 2011". REDD-Monitor. Retrieved 25 September 2015. ^ "State and Trends of the Carbon Market" (PDF). World Bank. 2008. Retrieved 2017-04-25. ^ "Allowance Trading Basic". US Environmental Protection Agency. Retrieved 26 Oct 2014. ^ a b Stavins, Robert N.; Jaffe, Judson (2008). Linkage of Tradable Permit Systems in International Climate Policy Architecture. Harvard Project on International Climate Agreements. ^ International Carbon Action Partnership. ^ Turney, Drew. "The Cap and Trade Pollution Solution". Net Resources International. Retrieved 21 May 2012. ^ "Statement of G8 Climate Change Roundtable" (PDF). World Economic Forum. 9 June 2005. Archived from the original (PDF) on 2013-05-08. ^ "Exxon supports carbon tax". Calgary Herald News. 2009-01-09. Archived from the original on 2009-01-22. ^ "What You Need to Know About Emissions Trading" (PDF). International Air Transport Association. Archived from the original (PDF) on March 3, 2007. Retrieved 2009-09-26. ^ "MRV&Enforcement". International Carbon Action Partnership (ICAP). Retrieved 26 Oct 2014. ^ Tiwari, Gopal Nath; Agrawal, Basant (2010). Building integrated photovoltaic thermal systems : for sustainable developments. Cambridge: Royal Society of Chemistry. ISBN 978-1-84973-090-7. ^ Ott, Hermann E. (1998-10-26). "Emissions Trading in the Kyoto Protocol, Finished and Unfinished Business". Linkages Journal. 4. 3. ^ Nordhaus, W.D. (2007). "To Tax of Not to Tax: Alternative Approaches to Slowing Global Warming" (PDF). Review of Environmental Economics and Policy. 1 (1): 27. doi:10.1093/reep/rem008. Retrieved 2010-04-28. ^ Ellerman, A.D.; B.K. Buchner (2007). "The European Union Emissions Trading Scheme: Origins, Allocation, and Early Results" (PDF). Review of Environmental Economics and Policy. 1 (1): 71. doi:10.1093/reep/rem003. Retrieved 2010-04-28. ^ Kruger, J.; et al. (2007). "Decentralization in the EU Emissions Trading Scheme and Lessons for Global Policy" (PDF). Review of Environmental Economics and Policy. 1 (1): 130–131. doi:10.1093/reep/rem009. Retrieved 2010-04-28. ^ Burniaux, J-M.; et al. (6 June 2009). The Economics of Climate Change Mitigation: How to Build the Necessary Global Action in a Cost-Effective Manner. Economics Department Working Papers No. 701. OECD. p. 56. Retrieved 2010-04-24. ^ Moore, John; Repullo, Rafael (1988). "Subgame Perfect Implementation". Econometrica. 56 (5): 1191. doi:10.2307/1911364. JSTOR 1911364. ^ Kahana, Nava; Mealem, Yosef; Nitzan, Shmuel (2008). "A complete implementation of the efficient allocation of pollution". Economics Letters. 101 (2): 142. doi:10.1016/j.econlet.2008.07.003. ^ Duggan, John; Roberts, Joanne (2002). "Implementing the Efficient Allocation of Pollution". American Economic Review. 92 (4): 1070. doi:10.1257/00028280260344614. ^ Lohmann, Larry (2006-12-05). "A licence to carry on polluting?". New Scientist. 2580. Archived from the original on 2006-12-05. Retrieved 2010-07-17. ^ Lohmann, Larry (2006b). "Ways forward (The Corner House)". The Corner House. Retrieved 2009-04-03. ^ Carbon Trade Watch (November 2009). "Carbon Trading – How it works and why it fails". Dag Hammarskjöld Foundation. Retrieved 2010-08-04. ^ Annie Leonard (2009). "The Story of Cap and Trade". The Story of Stuff Project. Archived from the original on 2010-11-03. Retrieved 2010-10-31. ^ Kill, J. (July 2006). "10 things you should know about tree 'offsets'". New Internationalist. Retrieved 2010-04-28. ^ a b c Hepburn, C. (2006). "Regulating by prices, quantities or both: an update and an overview" (PDF). Oxford Review of Economic Policy. 22 (2): 236–239. doi:10.1093/oxrep/grj014. Archived from the original (PDF) on 14 January 2009. Retrieved 30 August 2009. ^ Bashmakov, I.; et al. (2001). "6. Policies, Measures, and Instruments". In B. Metz; et al. (eds.). Climate Change 2001: Mitigation. Contribution of Working Group III to the Third Assessment Report of the Intergovernmental Panel on Climate Change. IPCC. Retrieved 2010-04-26. ^ "Fiscal Implications of Climate Change" (PDF). International Monetary Fund. March 2008. pp. 25–26. Retrieved 2010-04-26. ^ "Climate change; The greening of America". The Economist. 2007-01-25. Retrieved 2009-04-03. ^ Fisher, B.S. ; et al. (1996). "An Economic Assessment of Policy Instruments for Combating Climate Change" (PDF). In J.P. Bruce; et al. (eds.). Climate Change 1995: Economic and Social Dimensions of Climate Change. Contribution of Working Group III to the Second Assessment Report of the Intergovernmental Panel on Climate Change. IPCC. p. 417. doi:10.2277/0521568544. ISBN 978-0-521-56854-8. ^ Cambridge Centre for Climate Change Mitigation Research (19 June 2008). "The Revision of the EU's Emissions Trading System". UK Parliament. Retrieved 2010-04-28. ^ Stone, Chad; Shaw, Hannah (2009-07-10). "Senate can strengthen climate legislation by reducing corporate welfare and boosting true consumer relief" (PDF). Centre for Budget and Policy Priorities. Retrieved 2010-01-27. ^ "Linking Emissions Trading Systems: A Summary of Current Research", ICAP 2015. ^ The House of Commons Energy and Climate Committee, 2015: Linking emissions trading systems. London. ^ "Quebec, Ontario, Manitoba sign agreement to link cap-and-trade systems", CBC News, 7 December 2015. ^ "California-Ontario-Québec Agreement on the Harmonization and Integration of their Cap-and-Trade Programs" (PDF). California Air Resources Board. Government of California. Retrieved 14 November 2017. ^ "International Carbon Action Partnership (ICAP)". Retrieved 25 September 2015. Susanne Schennach (2000). "The Economics of Pollution Permit Banking in the Context of Title IV of the 1990 Clean Air Act Amendments". Journal of Environmental Economics and Management. Elsevier. 40 (3): 189–210. doi:10.1006/jeem.1999.1122.